Explosion proof electrical fittings provide protection from sparks or flame in environments where flammable gas or combustible dust are present. These items are designed to safeguard people and equipment in hazardous locations. 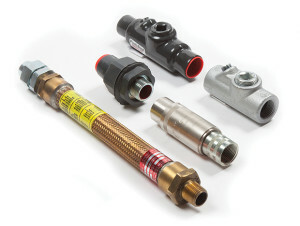 We maintain a broad inventory of explosion proof items. Our deep inventory of explosion proof products includes: flexible conduit, seal-offs, enclosures, unions, bodies, conduit fittings, lighting, plugs and receptacles. No one in the Northwest has more onsite explosion proof material ready for delivery. • We stock explosion proof flexible couplings from half inch diameter up to three inch diameter. And from four inches in length up to six feet in length. • Our inventory includes explosion proof conduit seal-offs in a variety of styles such as female/female, male/female, and expanded fill. Our deep inventory spans every size from half inch to four inch and larger.